According to research by CoBloom, in analyzing the Montclare SaaS 250 list, they found that the top 10 percent of SaaS blogs brought in an average of 45,700 organic search visits, while the bottom 10 percent brought in only seven. The typical blog brought in 573 visits. As those numbers make it obvious, content marketing can be a tremendously powerful source of leads, but the discrepancy in efficacy is absolutely staggering. That makes your choice of content marketing strategy an absolutely vital piece of your marketing puzzle. A successful content marketing strategy is built on a fundamental understanding of how content marketing works, its strengths, its weaknesses, and the ways in which those strengths and weaknesses line up with the rest of your business. Let’s talk about how to build a content marketing strategy for your SaaS business, step by step. No company would turn down the 45,700 organic search visits brought in by the top ten SaaS blogs, but traffic is only one way to measure the success of a blog. If you operate under the assumption that growing traffic is the only thing you should be concerned about, you will optimize for the wrong things and find yourself dissatisfied with the results. Nor is it specific enough to simply state that your goal is to produce ROI. That is both obvious and basic. Asking how soon you hope to see ROI from your blog is closer to the kind of question that will lead you in the direction of a goal, but it’s still not enough. A strategic goal is not a metric, or a figure. It is a clear statement of something you hope to achieve. It should be concrete, and it should be a statement about the role content marketing plays in your business’s structure and processes. In defining your goals, it’s also useful to understand the value of content marketing, especially in the ways that it can be different from other forms of marketing such as ad placement. Content marketing built on sound SEO principles will add to the number of organic search visits you receive each month. This figure will grow with each new piece of content, but remain roughly the same if content development is ceased with a slow decay rate, as other competitors enter the search results. Content marketing built on strong list-building principles will grow your list of email, phone, and mailing contacts each month, allowing you to speak to a larger audience every month. If list-building efforts are ceased, this number of contacts will decay only as slowly as the unsubscribe rate. 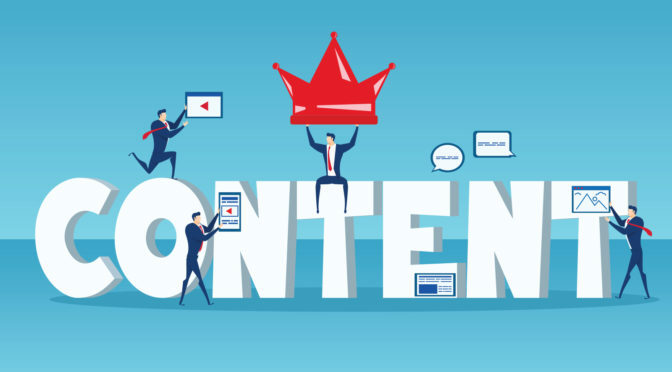 Content marketing built on a strong understanding and utilization of social media, especially in relationships with online influencers, will result in an increased ability to amplify your message with each new piece of content. Content marketing built with multi-channel knowledge as a foundation, will add to your monthly referrals each month. When channels are chosen appropriately, content publication adds not only a temporary bump in awareness, but also a long-term bump to your monthly referral traffic. Consider content marketing’s cumulative nature as you develop your strategic goals. Only after defining your strategic goals should you start concerning yourself with metrics and statistical goals. Ask yourself, which metrics best measures progress as it relates to your strategic goals. Here are a few metrics to consider. Increase in monthly visits per dollar invested. This is a more useful figure to consider than merely the number of visits per dollar invested. Since, organic search traffic grows in roughly cumulative fashion, this tells you a great deal about how each dollar spent increases the total number of leads you have access to. Channel of first contact, content of first contact, time from first contact to sale, path from first contact to sale, and similar metrics. All too often these considerations go ignored, and only the final step in the sales process is attributed. First-touch attribution is as important a consideration, as last-touch attribution. We should not assume that only the bottom of the funnel matters just because every contact passes through it. Average lifetime value of each unique visitor. For every discernably unique visitor, how much will they ultimately end up spending on your company on average? If this is low, it could speak to the quality of your keyword choices, the quality of your sales funnel and list building, customer longevity, or even to your lack of investment in determining whether current buyers were previous visitors. Percent of visitors who are new and returning. It’s not necessarily bad if either one of these is low or high, but a high percentage of new visitors should correspond with an influx of traffic, and a high percentage of returning visitors should indicate loyalty rather than stagnation. Weigh these metrics against historical growth for insights. Increase in subscribers or contacts per dollar invested. If this is low, it’s important to ask if this is due to low traffic, low conversions, high subscriber turnover, low prioritization of lead magnets and other list building sensibilities, or other factors. Sign-ups per visitor. This could measure signups for the SaaS or signups for a free trial. While this metric isn’t as immediately financially informative as the average lifetime value of each unique visitor, it can sometimes be more strategically informative. If this number is high but the average lifetime value for each visitor is low, it could potentially speak more to issues with the SaaS than the content marketing. This can reflect the loss of opportunities to increase customer loyalty for using content marketing. Any of the above for specific channels, such as organic search, referrals, email lists, social media, or even specific pieces of content. In addition to metrics as a tool for making strategic decisions, it’s important to consider the growing roll of analytics in personalizing marketing, especially through lead automation and email marketing. Leads, who visit specific pages regularly, are more likely to end up buying the product/services offered. If this is the case, it may also be worth, using marketing automation to target leads who have visited these pages without making a purchase with a related offer. Likewise, it is worth testing whether leads are more likely to make a purchase if sent a message about pieces of content that have led others to make purchases, especially if their journeys have been similar. Marketing automation is no longer in its infancy, and these are all the factors you should be considering whether to and how to incorporate it into your content marketing strategy. The question to answer here is what it looks like for a lead to make the journey from where they start to where they make a purchase. Rather than merely naming the standard steps of awareness, interest, decision, and action, you should consider a few, more concrete, sales funnels. Determine which ones have already been formed naturally using your own data, how these natural funnels could be optimized and built out, other potential forms the sales funnel could take, and how these existing and potential sales funnels interplay with the brand identity you are trying to build. It’s important to build these funnel models conceptually as well as use measurement to hone their efficacy. It’s not uncommon for us to make assumptions about how our sales funnel works, but we can’t know this without measuring those assumptions up against reality. At the same time, it’s equally important not to let reality cloud possibilities. It is dangerous to assume that optimization of existing funnels is the only way to improve the results of content marketing efforts. Expanding the funnel into new markets and higher stages of the funnel is crucial, and can discover business opportunities that would otherwise remain invisible. While all of the steps in this guide should be re-visited and re-worked on a regular basis, finding your audience is arguably the most recurring step in the process, potentially even more persistent than producing the content itself. Of the two, focusing on a narrow audience is most common. The rookie mistake is to use a blog as a PR outlet and nothing more. SaaS companies who hope to achieve cumulative growth with their content strategy must focus on reaching leads who do not already have an interest in the business, and that typically means producing educational content. The CoBloom study referenced above found that educational blogs run by SaaS companies drew an average of 14 percent more organic search traffic than SaaS companies who focused on PR or news-related content. More importantly, of the top 10 percent of SaaS blogs, only 24 percent focused exclusively on PR or news. Thirty-six focused on educational content, and 40 percent did both. Focusing exclusively on PR and news is the most obvious way to choose an audience that is too narrow, but it is not the only one. Developing content entirely for the business press when your audience is not B2B. Likewise, writing exclusively for entertainment, consumer, and freelance media platforms when your audience is big business. In developing a content strategy, you need to consider every possible use case for your SaaS and identify the problems tangential to it, and then develop content that will help those leads solve those problems, and do so in a manner that will build your audience, as opposed to briefly helping them and then falling off their radar. What kinds of queries will these leads be searching for in Google? Whom will they be following on social media? What social networks, message boards, discussion groups, and newsletters will they be actively visiting? What YouTube channels will they be viewing? What magazines, blogs, and newspapers will they be reading? How far can you stretch the use-cases to fit these audiences without the appearance of cynicism? While it won’t always be possible to position yourself on all of these platforms directly, it’s important to be aware of as many platforms your audiences are interested in, as possible. In addition to offering content placement opportunities and an awareness of your audience’s interests, it will help you identify who is influential to your audience. If you target these influencers as a part of your audience, you can multiply your reach dramatically if these influencers take the step of sharing your content with their own audiences. If you’re at the stage of considering content marketing for your SaaS, odds are you have already done a great deal of work in defining your unique selling proposition, identifying who your competitors are, and making an effort to differentiate yourself from them. I will not lecture you on how to do this. What is crucial here to recognize, however, is that content marketing brings its own host of competitive implications for consideration. Competing over attention is different from competing over purchase intent, in many ways. The most obvious difference is that your competitors in the content sphere will be, in many cases, entirely different companies from the ones you will compete with in SaaS. You can start by analyzing your direct competitor’s backlinks to see where they have been mentioned, analyze their content for keywords and topics, and use this along with some intuitive browsing to get a sense for what their content marketing strategy looks like, what platforms they are targeting, and so on. None of this will be of any use to you; however, unless it helps you identify weaknesses that you can overcome in their content strategy. If you merely emulate what they are doing, just as with your SaaS product, your content itself will fail to have its own “unique selling proposition”, and leads will choose to consume their content elsewhere. If you fully embraced the point of step 4 above, you should already recognize that analyzing your direct competitors would be limiting. Odds are, most of them don’t have particularly strong content marketing strategies. While this means you may be able to outcompete them in a few areas where their content strategy has been deficient, it also means that you won’t discover many novel opportunities. Consider, instead, how your unique perspective from your own little corner of SaaS can be useful to those in other industries, in other areas of the content sphere, where audiences with a reasonable customer journey that ends with them signing up are reasonable. Taking this approach, it becomes much easier to identify your unique selling proposition as a content provider, in contrast with other content providers in these industries, who are all stuck in their own little niches. Now that you have identified your audiences and your competition, you can start to develop a coherent message. It’s likely that you have already developed a brand identity that you want to communicate. However, as a content marketer you need to identify the specific sets of problems you are trying to address for leads, identify how content built around those problems can be customized for several platforms, and identify how you will draw leads from those platforms onto your own properties and contact lists. This process comes to a head in the next section. As we discussed above, by now you should be considering exactly which problems to address with your content, but it would be a mistake to move on to anything else without discussing keywords. Since search engines are such an important part of the customer journey in the vast majority of cases, especially for tech industries like SaaS, it would be a mistake to develop a content marketing strategy without considering keyword research. Keyword research tells you precisely what people are searching for in search engines, which tells you how popular certain types of questions are, and can help you gauge which problems to address first. To get the biggest selection of questions and variations on a keyword, I would recommend using keywordtool.io. This is the free tool with the most variations I’m aware of. For competitive research, if you’re willing to pay for a tool, I would recommend SEMrush. As mentioned above, however, when competitive research is on the cards you should generally target identifying the keywords targeted in a relatively weak fashion by those competitors, you are confident that you can outperform. Be sure to spend some time on all of the platforms you identified in the section on finding your audience that is looking for statements about problems and questions about how to solve them, especially if you come across any of those that are asked frequently but never addressed, satisfactorily. These are the golden opportunities. It’s best if you can identify search phrases for these questions in a keyword tool, but in some cases you won’t be able to find them. I’ve used this strategy enough to know that if a question gets asked many times, you can pick up search traffic for it even if you can’t identify the specific phrase to use. Keywords are less of a consideration than topic when you are producing content for distribution through platforms that you don’t personally own, especially if the platform in question has a steady flux of its own traffic and the purpose of the content is to leverage interest in the platform and spread novel information through it. In places that already have a stream of traffic, novelty, leading to social sharing, is often more important than search engine traffic. Even so, working keywords into the content is important in order to achieve cumulative growth. If your goal is to build up a subscriber base, try to focus on keywords that indicate a desire for something deeper than a blog post, such as an e-book, whitepaper, case study, resource, or something to that effect. While it isn’t always possible to infer this from the search query, it’s helpful to keep this user-intent in mind. If you are doing any list building at all, be sure to choose keywords that naturally lead into your lead magnet at the end of your blog post or other piece of content. Content that won’t naturally lead readers to the next step is generally a waste of time. Bear in mind that modern search engines are highly intelligent compared to their predecessors, and you should generally stick to one, perhaps two, keywords per concept. In other words, do not overstuff your content with variations on the same keyword, or publish several pieces of content on your own site about the same thing, just because they use slightly different keyword variations in the title. We have quite often mentioned here the importance of building a list, and there is no way to understate this. Your email list is your content marketing lifeline. Readers are simply too fickle and forgetful to find you again in most cases, and we really should not expect it to be any other way. Typically, a lead will end up downloading this resource after being enticed by a blog post or another piece of content, generally one designed to solve or address a problem related to your core product, and that naturally leads the reader to download the resource as a next step. The call to action to download the resource is as contextual as possible for the platform, and should be highly on topic, for the piece of content just consumed. A lead may also download the resource after landing directly on a landing page for it, but in this case, the landing page will need to build the trust and address any objections that the lead has before they will be convinced to give away their email address. In the section on finding your audience, you should have identified the major platforms your audience spends time on. In the outreach stage, you will be using any platforms you can publish to directly, as well as contacting any influencers who have an audience containing leads that are a good fit. Publication: In which you approach a contact or platform with content, with the goal of publishing your content on the platform and driving traffic to your site as a result. Promotion: In which you point your audience or their influencers in the direction of a piece of content you have published on one of your own properties. An outreach strategy should be diverse enough that it doesn’t rely exclusively on any one platform, or method of promotion. For example, while guest editorials are still one of the most robust methods for distributing your content, they shouldn’t be performed in isolation. Involve influencers in the creation of your content, such as by asking for a quote from them, so that you can cite them as an expert and let them know once the content is published. Mention influencers in your content, and then reach out to them after publication to let them know. Address specific complaints or problems that the influencers have had within your content, and follow-up with them after publishing the content. Outreach strategies should be tailored to each specific piece of content, but it’s important that you also have an eye on a broader strategy. Relationships play a key role in a successful outreach strategy, and this means that you should always be thinking several emails down the line, rather than about what you can get right now. Your content cycle should be designed so that it is both easy to follow and easy to adjust, and it should be constructed in such a way that it naturally adapts to changes in the marketplace, to the content landscape, to the shape of your sales funnel, and to your brand identity. The discrepancies in performance between poor content marketing strategies and smartly developed ones are enormous. A sound content marketing strategy for SaaS considers, strategic goals before metrics, considers cumulative growth, uses a clarified sales funnel as its foundation, targets diverse audiences and carefully chosen keywords, builds a contact list, and sticks to a rigorous but adaptive production cycle.